Scattered Thoughts On Books. 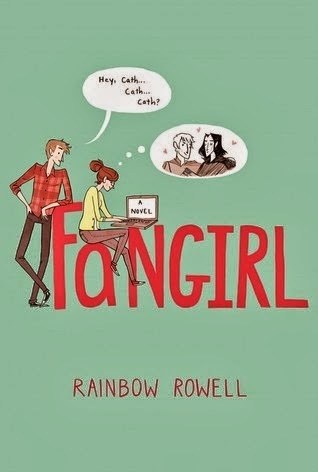 : Fangirl - Rainbow Rowell. Reading. Rereading. Hanging out in Simon Snow forums, writing Simon Snow fan fiction, dressing up like the characters for every movie première. Now that they’re going to college, Wren has told Cath she doesn’t want to be room-mates. Cath is on her own, completely outside of her comfort zone. She’s got a surly room-mate with a charming, always-around boyfriend, a fiction-writing professor who thinks fan fiction is the end of the civilized world, a handsome classmate who only wants to talk about words . . . And she can’t stop worrying about her dad, who’s loving and fragile and has never really been alone. Welcome to the obsessive world of fan fiction, College and Family. It follows Cath as she starts her freshman year at college without her twin who has dumped her to branch out on her own. Throughout the book she has to deal with her classes, her wild twins problems, her unstable dad who is unravelling without anyone at home, her runaway mother trying to get back into her life and her room-mates overly cheerful boyfriend. This book is written for the young adult market. For the nerdy 13-16 year old girl who loves fan fiction. As a 30 year old male I probably should not have enjoyed the book, however, the writing is solid and the story so enthralling I couldn't put it down until I finished it. Don't get me wrong its not Crime and punishment and I had it done in 3 hours, but they where a thoroughly enjoyable 3 hours, filled with fluff and quite an interesting family dynamic. The only thing that detracts is the Simon Snow extracts. You can see the similarities to Harry Potter however it hasn't replaced Harry in the universe as he is mentioned in the book, which detracts slightly. 8 out of 10 for an enjoyable bit of rainbows and teenage angst.